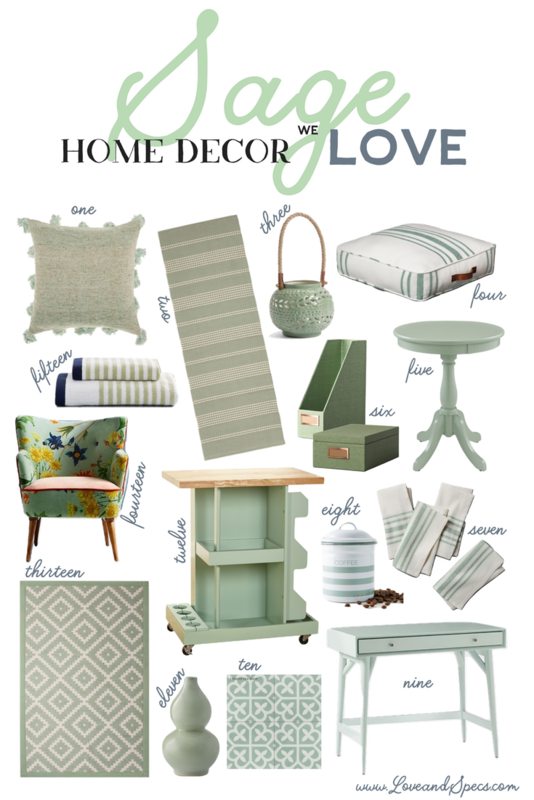 Mar 2 Sage: The Home Trend We Love! They're calling it the "new neutral" and let me tell you, ladies and gentlemen... I'm 100% here for it. According to Pinterest's 2018 Pinterest 100 trend forecasting report, "sage" is all the rage this year, and taking the home design and decor scene by storm! And yes, by sage I mean that cool grey-green color that could also be mistaken for about a million other shades of pale green (celadon, mint, pistachio... I could go on) and resembles, well, dried sage leaves. And I absolutely love it. According to Pinterest saves for "sage" have grown 170% as of late, but I like to think I was on the soft, serene green bandwagon long before Pinterest blew the lid off this thing. After all, seafoam green is my very favorite color and has been a big part of my home decor since I moved into my first place post-college, and I feel like seafoam and sage are birds of a feather. They're almost the same thing, no? Ok well not exactly, but pretty darn close. They're both a spa-like shade of cool, gray-green and scream versatility! Not quite as bright and bubbly as mint or as green as, well, greenery. More muted, more sophisticated. Sage, in all its green glory subtly brings the outside in, and blends well with pretty much any color palette, from warm tones to cool, which is why everyone's going gaga for this pretty shade. And I'm pretty much in favor of every sage home design and decor trend out there - kitchen cabinets, bedroom walls, tile backsplashes, tile floors, exteriors, couches, lighting, bedding, everything. It's all so good. I definitely have my eye on integrating more sage/seafoam accents throughout our home and am dreaming of the sage shower tile in the image below for our guest bathroom remodel that we're in the process of planning. Too much? Nah. Never! But I get it... trying trends can be scary, especially when they involve changing a wall color in your home or retiling your bathroom in a shade of green that has a tendency to get a little, er, murky. So to convince you that sage is, in fact, the new "Millennial Pink" and the best thing to ever happen to your home, I thought I'd round up a ton of my favorite sage home decor finds so you can dip your toes into the sage pond without making a 'til-death-do-us-part-level commitment. And yes, some of the shades of sage featured below (and above for that matter) may be a little cooler, or a little more minty, or a little more yellow or blue or green than others, but that's just the nature of the shade. See what I did there? Nature? Green? Sage? No? Ok I'll stop. My point? Sage is one of those shades that's slightly open to interpretation, so do you!